A rare photograph of a midget submarine named the 'Sprat' sent in by © William Marsh. 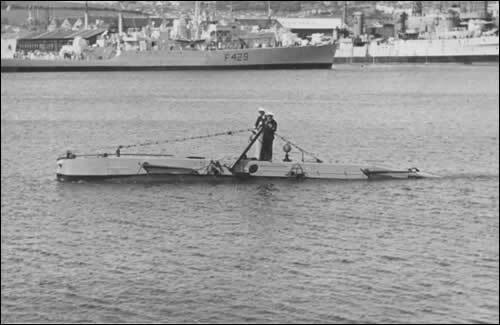 The X53 Sprat midget sub was launched on the 30th December 1954 and finished service in 1966, being broken up at Faslane, Scotland for scrap. They were known as the X-crafts and the various types that were made were given names. The X51 was Stickleback, X52 was Shrimp, X53 was Sprat and X54 was Minnow.